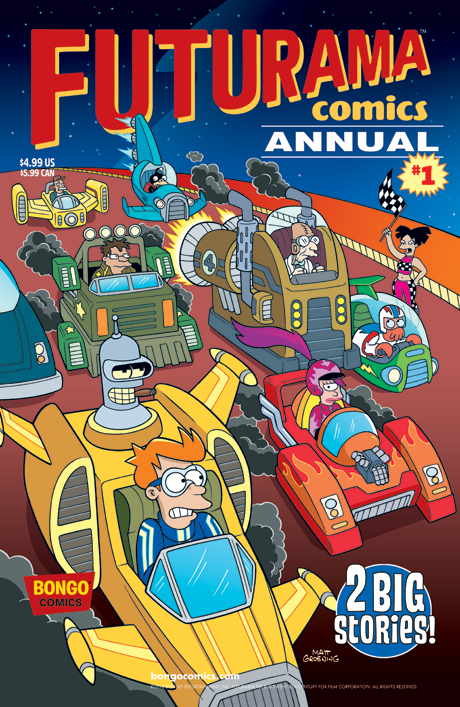 Futurama is back with a double issue/double feature! First, the Planet Express crew heads to a desert planet world to take part in a decadent partying event called Burning Mom, where a giant wicker statue of Mom will be burned in effigy. But the event sponsor, Mom herself, has plans to use the proceedings to even the score and rid the world of the revolting revelers. Then, while helping Leela with some volunteer work at the Orphanarium, Fry tells the children the bedtime tale of Bendocchio, the little robot who wishes to be a real meatbag. And with a little help from the Bluetooth Fairy and the keeper of his conscience, Jiminy Circuits, he may very well get his wish!